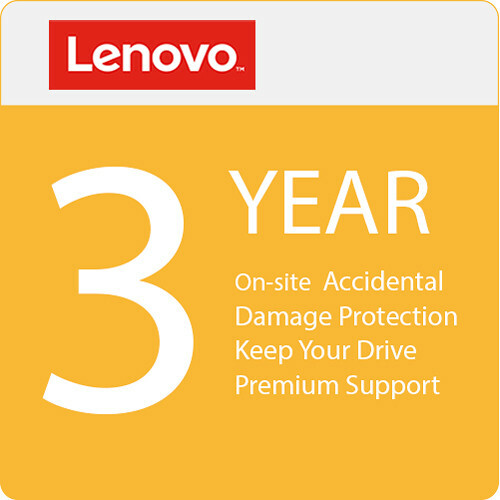 The Lenovo 3-Year Onsite Warranty extends your standard warranty and provides accidental damage protection for select Lenovo notebooks. It includes phone access support and covers labor and parts. When issues cannot be resolved over the phone, or with a replacement unit, Lenovo will send a certified technician to attempt a repair at your location with no shipping involved. On-site service is only available in metropolitan areas and during Lenovo's normal in-country business hours. Contacting Lenovo after 4:00pm local time requires an additional day for service to be scheduled. Next business day service is not guaranteed. Lenovo's Accidental Damage Protection covers a laptop from drops, spills, electrical surges, or failure of its integrated screen. Qualified Lenovo parts are used to make the repairs. If a repair cannot be made, the system will be replaced at no additional charge. Lenovo's Premier Support enables increased efficiency for in-house IT, SMBs, and Business Partners by providing direct tech-to-tech support with extended hours with a focus on advanced, unscripted troubleshooting through a single point of contact for end-to-end case management. With comprehensive hardware and software support, Premier Support prioritizes onsite and parts response and provides you with access to onshore Technical Account Managers. You'll bypass basic troubleshooting for faster first-time fix rates and responses. Under the terms of the Lenovo Limited Warranty Extension, when Lenovo replaces a defective drive, it becomes the property of Lenovo. Keep Your Drive enables you to maintain custody of your data, eliminating the need to track failed hard drives in transit and eliminating associated paperwork. Keep Your Drive covers multiple drives and failures, so data within individual PCs and Servers remains protected.